PCN Flight West: NWA Capt. Albert 'Bert' L. Kuiper Jr.
NWA Capt. Albert 'Bert' L. Kuiper Jr.
Below is a copy of the info. I received from Dan (US Coast Guard Captain) regarding their VATSIM tribute to Bert. It's a private link, but I think I have the right to share it! This tugged at my heart, especially since they are doing this one year exactly from the day of Bert's death. The draft video is terrific (and even Dane, now a Ph.D. in Computer Science agrees:) with NWA airplanes and Bert's 7774R Baron. Bert was in the left seat, of course and I was (eight months pregnant with Dane) in the right seat. We were meeting my parents in EAU and my Dad took the picture from his little Colt. Bert joked that he thought we would stall going slow enough for Dad to get the picture. It was Bert's favorite picture and airplane -- and ultimately was engraved on Bert's urn. Bert would have been so honored to have this happen for him. 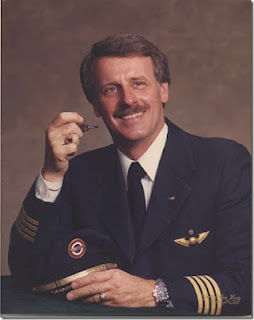 He was a mentor and real-time pilot to so many of his vatsim friends. I only wish he would have been alive to truly know how much they appreciated him. Good afternoon! I hope you're doing well. Thank you for the pictures of Bert, and of N7774R, they were incredibly helpful when creating the video. I don't need any more pictures for the video. The date for the fly-in is scheduled for this Sunday, May 19th. I'm just awaiting final confirmation of the start/end time of the event. I've cc'd Dhruv Kalra on this e-mail. He runs the Minneapolis ARTCC on the VATSIM network, and is the one who's making this memorial flight happen. Below is a private link to the draft video to announce/advertise the fly-in event on the VATSIM network. I chose to center around N7774R and all the Northwest Airlines airplanes Bert was a Captain of. The first portion of the video finishes with a traditional "missing-man" formation flyover of runway 30L at Minneapolis, in honor of Bert (the "missing man" is in a 727, as I remember him telling me how much he loved that plane). The video finally ends with a recreation of N7774R, taking off from runway 30L at Minneapolis, and turning off into the sunset. I greatly appreciate your help with supplying the pictures to make this video possible! I'm sure quite a few people will participate in the fly-in this weekend. Captain Bert Kuiper, age 74, flew west on his final solo flight joining God’s eternal family in the heavenly skies on May 19, 2012. Preceded in death by his parents, Albert and Harriet (Volkmar) Kuiper. Beloved husband of Cindy, Dad of Carrie and Chris, Papa of Dane. Born in Minneapolis, Bert’s family soon moved to the home his father built in St. Louis Park. As a youngster, Bert loved riding his bike, catching the latest movies and meeting friends at Cedar Lake. He delighted in his first job because he purchased his own car ~ which was great prestige at St. Louis Park High School. After graduation, MN Senator Roy Wier recommended Bert for acceptance at King’s Point. Attending for a year, Bert then joined the US Navy, was based in Norfolk, Virginia, serving four years as electrician’s mate first class. On his return to the cities, Bert worked for Honeywell, saving his money for flying lessons because he wanted to become a pilot. His dream came true when Northwest Airlines hired him in January, 1966. Working his way up the ranks, Bert quickly became a Captain, sitting in the left seat on the 707, 727, DC-10, 757 and the 747. He far preferred the take offs and landings of the 3-holer to the fanny fatigue of international flights! Bert lived and breathed flying and he was an excellent pilot. 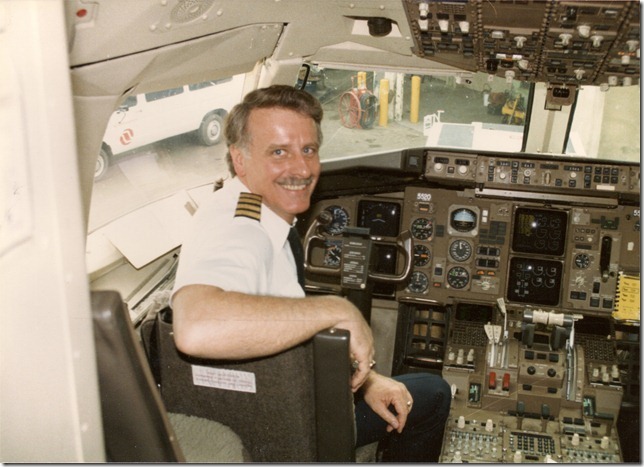 In his 32 years with NWA, he was proud of the fact that no passenger or aircraft was ever harmed under his command. His career afforded him, as most pilots, the luxury of toys … and he amassed a lot of them! The need for speed began with the newest cars (sometimes ending with speeding tickets! ), progressed to various boats and then to handgun competition. Bert’s aim was good, his hand was steady and he won numerous trophies. Being a proud member of the NRA, Bert earned the right to conceal and carry, thus becoming a “pistol packing Papa.” Over the years, Bert also enjoyed hunting with rifles and bow & arrow. While fishing had its stint, forever the mainstay of Bert was flying. It wasn’t enough that he worked for a major airline, so Bert flew charters for several FBO’s at Flying Cloud Airport. And, of course, there were “his” airplanes! While he owned several, the best gift he ever gave himself was a Baron, triple seven four romeo. Methodical and intuitive, Bert spent as much time spit-polishing it as he did flying it. Countless trips found us at Oshkosh, the Reno Air Races, various fly-ins, and pretty much anywhere there was a runway with a good restaurant nearby. Bert belonged to the category of people who “lived to eat.” While a good steak was of utmost importance, Bert adored pasta and truly was a “noodle nut.” He raved about Cindy’s spaghetti sauce, shrimp, chili and soups, but do not even think about putting a tomato on his plate! Through most of his life, Bert also relished a snifter of fine cognac together with a cigar or his pipe. When his tummy was full, he’d sit in front of his big TV with the surround sound and watch, and re-watch, and re-watch, any number of DVD’s from his collection. Life was good. When something tickled his funny bone, the Kuiper laugh would resound loud and clear. It was an infectious laugh and one couldn’t help but smile listening to him. On the other hand, if he wasn’t happy about something, his angry countenance made that apparent. Fondly called a “roasted marshmallow,” Bert was something of a paradox; hard and crusty on the outside, soft and mushy on the inside. Showing his softer side, Bert loved our four-legged family members. We lost Chimes, our Miniature Schnauzer, and Taupe, our Sealpoint Siamese, in recent past. They will be forever by Bert’s side at Fort Snelling National Cemetery, across the street from where he checked in at Northwest Airlines for thirty-two years and under the flight path of his favorite MSP runway, three zero left. As this vibrant, virile and bigger-than-life man faced declining health, we talked, we cried, we prayed and Bert made his wishes known. We now honor those wishes. Hearing his favorite Bible verse, the 23rd Psalm, and listening to Cindy play the Lord’s Prayer on the piano, we are thankful that when Jesus held out His hand to him, Bert did not hesitate. Bert loved and he was loved. He knew that and so do we. Capt. Albert ‘Bert’ L. Kuiper Jr.
Word has been received of the passing of NWA pilot Capt. Albert ‘Bert’ Kuiper, age 74. Albert L. (Bert) Kuiper, age 74. Kuiper, Albert L. (Bert) 74, Edina, died peacefully from prostate cancer on May 19. Services to be held at a later date with interment at Fort Snelling. Memorials preferred to NWA History Centre, Inc. I am in hopes that I am sending this information to the correct address. I would appreciate it if you can forward this email to the RNPA membership. It is with heartfelt sadness I share that Bert died on Saturday, May 19. In April, we began the sad ordeal of hospice care. As pilots, you might appreciate Bert slowly walking down the hallway and through the upper level of our home, guiding his walker down the straight and narrow "runway." He also thought the hospital bed was pretty nifty and he worked the bed controls with the aplomb of a veteran pilot. It took Bert awhile to relinquish medicine dispensing to me, his lead flight attendant, but when he did, "we" got that under control and he was pain-free. Another delight for Bert was when a neighbor put a wood duck house on our deck. My brother wired it for sound and complete picture access both inside and outside the duck house. Bert so enjoyed watching the ducks lay eggs and his goal was to see the duck's hatch. Bert's other huge goal was to see Dane achieve his Ph.D. and defend his thesis. While those things were monumental in Bert's brain, obviously God had other plans. On Friday, May 18, Bert was holding his own. According to the doctor and nurses, death was not eminent; for some reason, I thought they were being generous. Our neighbor brought over an incubated baby duck and Bert was able to hold it. He did not know it wasn't one of "ours." Too funny, also, wood ducks have claws on their little webbed feet. Bert was pretty impressed with that! Later that evening after I had given Bert his liquid meds., swabbed his mouth, put carmex on his lips, eyedrops in his eyes and lightly washed his face, he was trying to say something to me that I couldn't understand. Since he was never Mr. Patience, I didn't want him to become agitated and am amazed because out of nowhere, God told me to turn my face away from Bert and listen to him as though he was deaf. (As a flight attendant, I had learned sign language, did many flights with deaf people and could understand their vocal utterances.) Bert was saying "the Lord is my shepherd" from the 23rd Psalm, his favorite. His eyes brightened as I recited the Psalm several times. I hadn't played piano since December, broken foot and all, but asked Bert if he'd like me to play piano for him. Lord knows the many hours of our lifetime together he has listened to me play piano. He nodded his head and I went over to play the Lord's Prayer. As I did so, tears were streaming down his face. I finished the song, limped over to him, dried his tears and said I didn't want to upset him. He said, "no, go play." I played many of his favorite songs, soothing for both of us and then sat by him for quite awhile, holding his hand and praying out loud. On Saturday, Bert slept most of the day as was the norm now. He was never comatose and I could wake him if need be. I was never far away from him all day. For some reason, and again only God knows in His mysterious ways, I gave Bert his medicine, did the eyes, mouth, etc. as I so often did and then said "I bet you'd like to hear the 23rd Psalm again." He squeezed my hand as I said it. Then I told him I was going to go play the Lord's Prayer again. We held hands a bit, then I folded his together and went to play the piano. The song is four pages long. As I watched him and played page 2, I thought, my, his breathing is so shallow ... this man I have been listening to breathe and snore for 38 years. On page 3, I was watching his chest more than I was my music. On page 4, I had tears running down my cheeks and my brain kept on saying watch for him to breathe, Cindy. I couldn't see his chest/diaphragm rise, but I couldn't be sure it wasn't because I couldn't see through my tears. I finished the piece out of reverence and honor, let the sustaining pedal take away the music and I hobbled over to Bert. I tried to find a pulse in four places and could not. I limped to a phone, called my wood duck neighbor and he and his wife came over immediately. With tears in his eyes, Dave told me he couldn't find a pulse either. Bert was not afraid of death, but he was afraid of dying. The only person Bert and I have ever seen die in front of us was Bert's dad ~ way back in 1974. It was a horrible, gasping, gurgle, cessation of breathing only to breathe again and I know that weighed on Bert and caused him fear. I take great solace from the fact that Bert's death was truly peaceful. He died knowing he was loved and that he loved in return. Oh, my heart. As I said earlier, Dane is currently in the throes of the culmination of his educational goal. Bert never would have wanted to interfere with that. Dane and I had many conversations about him coming home. Bert did not want to upset Dane's progress and he was always so very proud of Dane. For my part, I told Dane that there was no right or wrong in coming home, but that he should know whatever decision he made, he would have to live the rest of his life with that decision. In all honesty, I knew Dane did not need to see the shell of a man his father, his "Papa" had become. (I didn't want to see that either. So often in the past months, I had thought "Who is this person, so frail, so weak, so needy? Where is the vibrant strong man I married? Where is my husband, Bert?") I knew Dane's memory would be better served remembering Papa from the month Dane was home over Christmas. I am ok, Dane is ok. Bert knew Dane and I are both strong, intelligent people and he was ok leaving the two of us to help each other. We are, however, so very sad. Dane's last conversation with Bert was late Thursday/early Friday morning. All Bert said was "I love you" and all Dane said was "I know you love me and I love you too." With Dane's dissertation upcoming, many family members having paid for vacations/flights, plus a wedding in early July, and the fact that, per his wishes, Bert has been cremated ~ we are planning a memorial service for Bert in July (no suits or ties!) and interment at Fort Snelling the following day. Ultimately, Bert and I will both be at Fort Snelling cemetery, how fitting ~ across the street from where he and I checked in at NWA for so many years ~~ and the cemetery is at the end of his favorite MSP runway. I have chosen a beautiful cherry-wood urn and his favorite Baron, 7774 romeo, will be etched on it. (My Dad took that picture from his little Colt and Bert joked at how slow he had to fly to allow Dad alongside him. Also interesting is that I was 8 months pregnant with Dane at the time the picture was taken.) As I talked with the cremation society person about fonts, etc., my brother Gordy (a licensed funeral director who is going to officiate at Bert's funeral and Fort Snelling) bragged about my calligraphy and how proud Bert always was of that. The end result of that conversation is that I am going to do my calligraphy regarding Bert and it will also be etched on Bert's urn. Thank you for caring, thank you for sharing his love of flight, and thank you for your prayers and good wishes as Bert has made his final flight west.